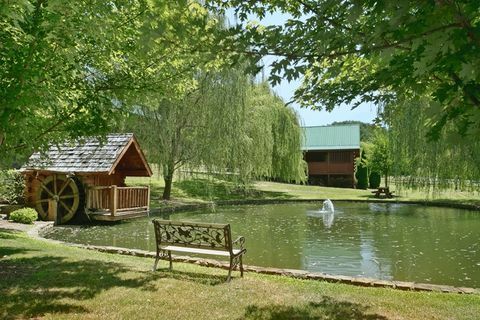 "Whispering Pond" offers a charmingly romantic cabin near Dollywood that rests next to a beautiful pond in Cabins At The Crossing Resort. 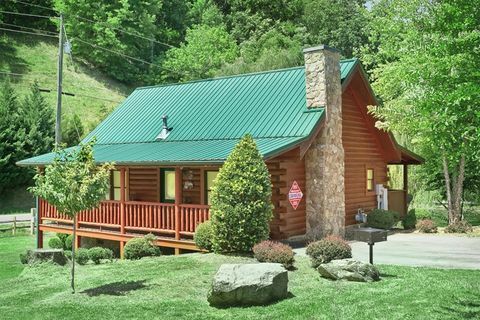 Your cabin resort places you just minutes from Dollywood and Light #8 in Pigeon Forge. 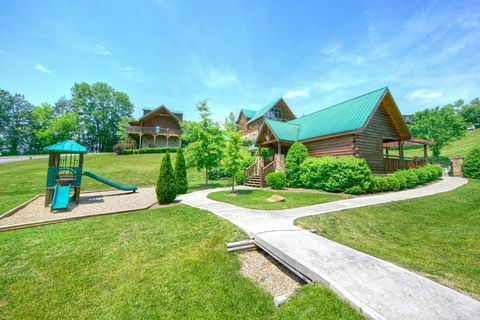 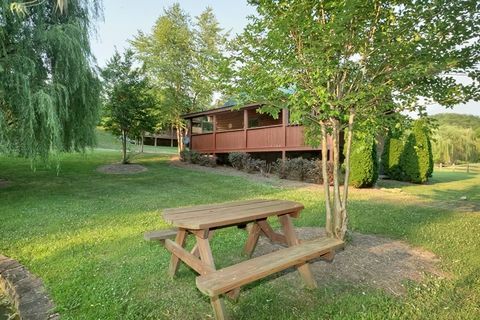 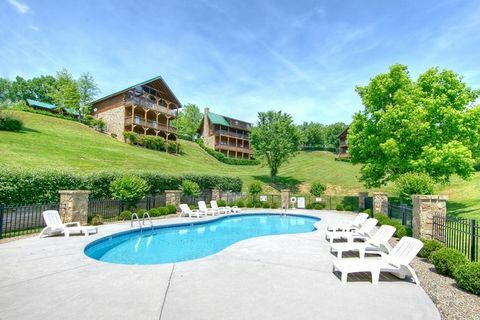 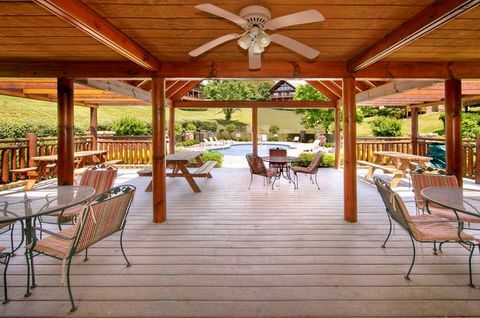 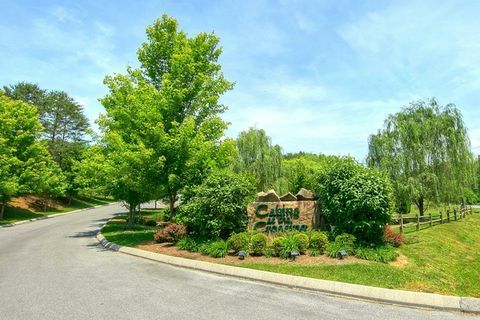 As a summertime guest of this honeymoon cabin near Dollywood, you can enjoy the resort's outdoor swimming pool with pool house, changing rooms, free WiFi Internet, picnic tables, and nearby children's playground. 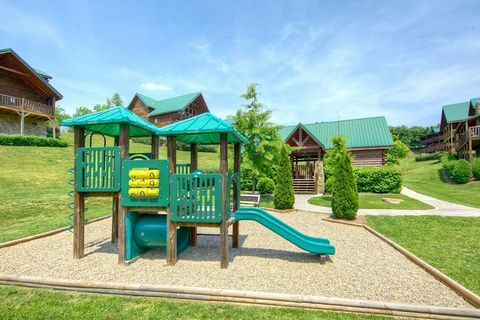 No matter which direction you take from this well maintained Smoky Mountains resort, you'll discover endless fun and adventure close by! 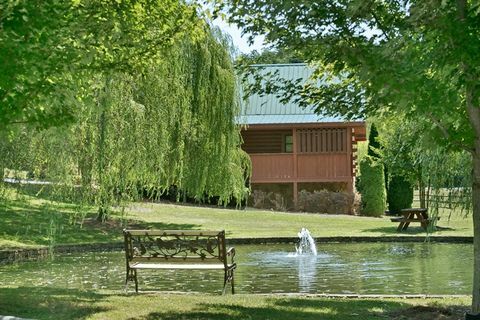 Attractions, live stage performances, outlet shopping, restaurants and more - all rest within minutes of your romantic honeymoon cabin. 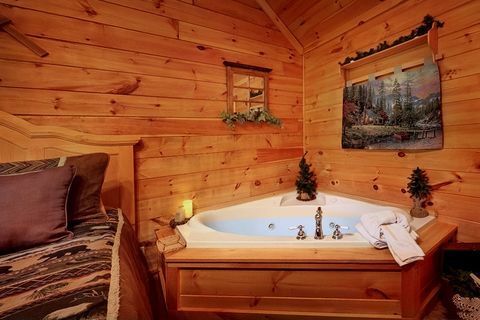 "Whispering Pond's" interior offers everything needed for a romantic getaway to remember, particularly in its spacious bedroom. 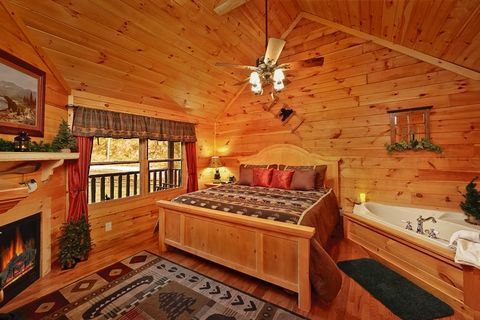 Your bedroom offers a very comfortable king-size bed with elegant linens. 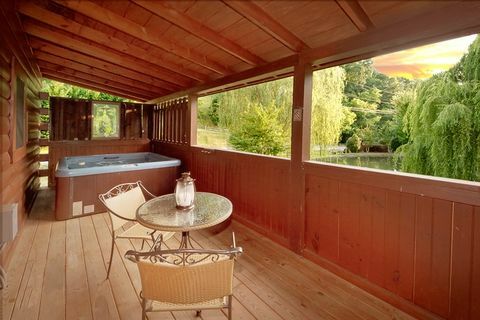 Beside the bed rests jacuzzi for two to unwind. 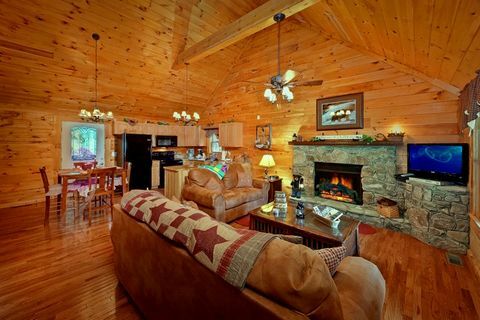 The mood-setting seasonal gas fireplace warms the entire room and casts an ambient glow in the evenings. 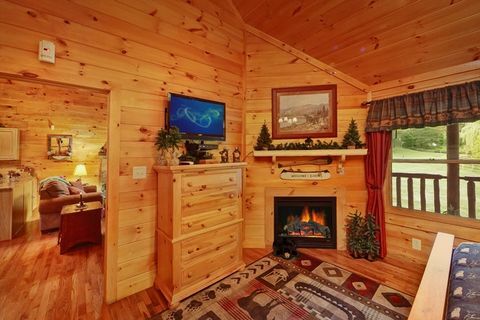 Curl up in bed and watch a movie on your flat-screen television. 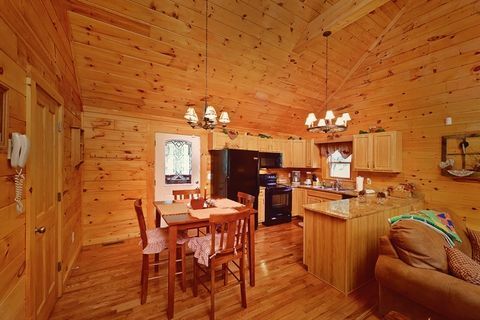 There are plenty of other features throughout this honeymoon cabin near Dollywood couples will enjoy. 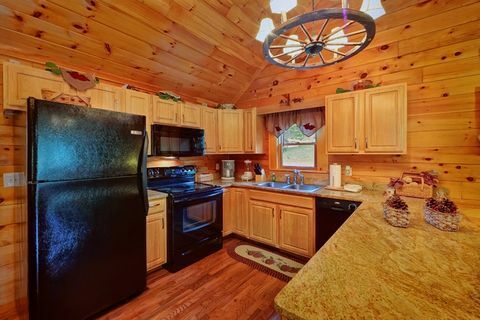 The cabin offers WiFi Internet, so you can stream music and movies anywhere within the cabin. 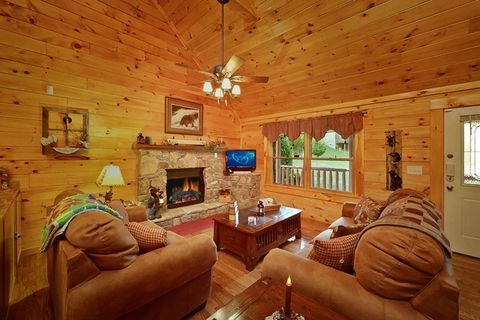 The cabin's living room with a gas log fireplace, flat-screen television, and elegant, oversized furnishings creates the perfect space to watch the big game or a favorite show. 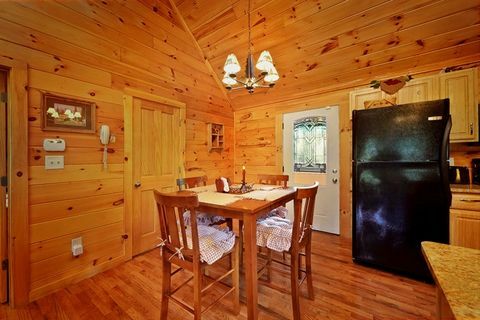 The spacious kitchen and charcoal grill allow guests to enjoy romantic meals at the dining table. 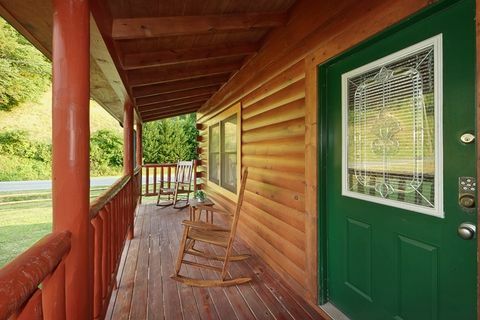 Step outside to relax on the cabin's porch overlooking the resort pond, and take a soothing dip in your hot tub while listening to the soothing sounds of the pond's water fountain. 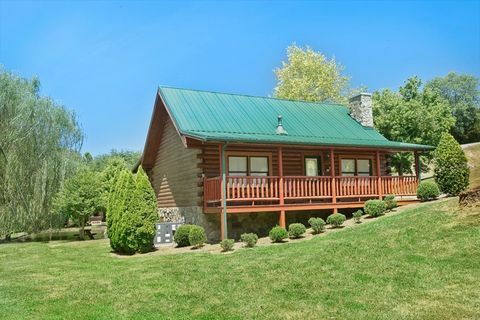 Planning your Smoky Mountains honeymoon or weekend retreat? 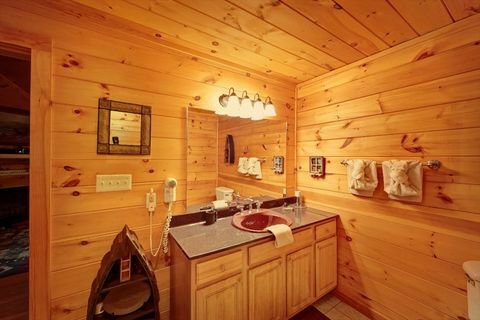 Consider "Whispering Pond" your log home cabin in the Smokies. 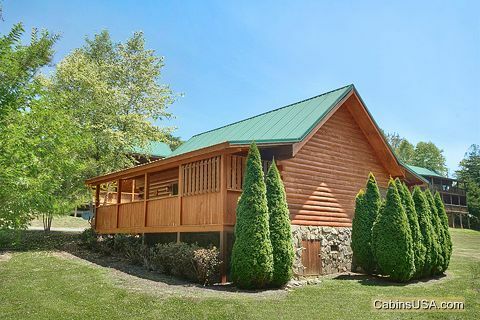 Remember, when you BOOK your romantic honeymoon cabin near Dollywood ONLINE with Cabins USA Gatlinburg you get an immediate Online Cabin Rental Discount!